Beautiful skin is only a thought away with LaBeauté®, a skin enhancement tablet that will make your toughest critics stand up and take notice. LaBeauté® is the only holistic approach to skin care that focuses on your internal as well as external health and homeostasis. LaBeauté® tablets may visibly reduce fine lines and wrinkles due to the destructive action of free radicals or environmental abuse. 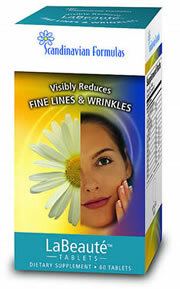 This unique product works to address each aspect of skin enhancement and overall skin health.